This article in the South China Morning Post raises the autonomy issue. What means a "high degree of autonomy"? Is it what Generalissimo Chiang Kai-Shek's enunciated in his speech to the Kuomintang Executive Yuan on August 24, 1945? Michael C. Davis says that Beijing argues that asking for a 'high degree of autonomy' would be the equivalent of 'independence'. It is not automatically true, there are in Europe for example, several genuine cases of 'regional autonomy' which work. Davis has a point when he affirms: "No explanation was given why the same guarantee of a 'high degree of autonomy' for Hong Kong is not deemed independence." The answer is perhaps that Beijing is aware that Tibet was independent in the past, and though China will never admit it, that makes Tibet different from Hong Kong. This issue of 'autonomy' brings more questions. The Dharamsala's Memorandum of Genuine Autonomy for the Tibetan People asks for genuine autonomy in fields such language, culture, religion, environmental protection, education, and natural resources. I am not sure in which category 'tourism' comes, but the transformation of the Tibetan plateau into a mega museum, is certainly a subject that an 'autonomous' government would like to control. Yesterday, the China Securities Journal reported: "Road construction in China's central and western regions will speed up following a central government vow to boost the expansion of the railway sector." According to this source, "In Tibet, authorities will spend 200 billion yuan ($32.3 billion) to build a road network centered around the regional capital of Lhasa over the next five to eight years, as well as extend the combined length of the region's highways to over 110,000 km. The construction projects will be funded using multiple channels, including fiscal investment and corporate bonds." Now, will this type of development comes under the Central government or an 'autonomous local government'? The Chinese answer is clear: the Centre. And who will decide of the quantum of Chinese tourists allowed to visit Lhasa every year (15 millions next year). It is clear that these road development's plans have for objective to cater to these millions of Han tourists. Can it be stopped under a 'genuine autonomy' scheme? Once again, one can doubt that Beijing will renounce this god-send opportunity to control Tibet. The Journal quoted earlier says: "The central government vowed last week to speed up reforms concerning investment and financing in the railway sector, including establishing a railway development fund using government investment and social capital." And let us not forget that these roads and railway lines can also be used for military purpose, if and when required. Hong Kong does not have all these problems. Following the 120th Tibetan self-immolation in protest at Beijing's alleged autonomy policies, Hong Kong people - themselves the subject of autonomy guarantees - may wonder why ordinary Tibetans are so dissatisfied. On the face of it, Beijing and the exiled Tibetan leaders should be able to find a solution. 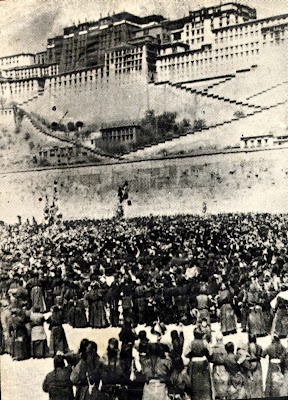 In the 1951 Seventeen-Point Agreement, sometimes considered a precursor to the Hong Kong agreement, Beijing promised Tibetans could carry on under their traditional self-rule - with Chinese sovereignty. But the excesses of China's early communist period eventually led to the collapse of the agreement and the 1959 flight of the Dalai Lama. China then proclaimed the system of "minority nationality autonomy". Tibet was divided into 13 autonomous areas: the Tibetan autonomous region and 12 adjoining areas in neighbouring provinces. The problems lie in the failure to fully implement the national minority autonomy laws and the use of repressive policies to contain resistance. To address these problems, the Dalai Lama long ago conceded claims for independence in favour of autonomy under his "middle way" approach. After the bloodshed of the 2008 protest, he was invited to elaborate on his proposal under the People's Republic of China constitution, which he did in his 2008 Memorandum of Genuine Autonomy for the Tibetan People. It urges genuine autonomy in areas including self-government, language, culture, religion, environmental protection, education, and natural resources. This largely tracks China's existing national minority commitments, but also seeks control over immigration and public security, similar to the Hong Kong model, and the uniting of all Tibetan areas. Responding dismissively, Beijing argued that this was the equivalent of asking for a "high degree of autonomy" and that would be the equivalent of "independence". No explanation was given why the same guarantee of a "high degree of autonomy" for Hong Kong is not deemed independence. The seemingly shared commitment to autonomy in Tibet has been undermined by a lack of trust. Beijing worries that "genuine autonomy" is just the first step on the road to real independence. The Tibetan side, after their tragic experience to date, is surely doubtful about conceding any ground without iron-clad guarantees. Beijing has also pressed the Dalai Lama to concede to its widely disputed claim to have always historically ruled Tibet. The Dalai Lama will only acknowledge an historical imperial religious relationship with China. For him, autonomy is merely the only option realistically available under difficult circumstances. Even under Chinese historical accounts, Tibet would have enjoyed genuine autonomy throughout the imperial period, when indirect rule of peripheral areas was the norm. A careful look at the Tibetan memorandum reveals that it not only largely tracks China's own proclaimed policies, but also international standards reflected in the 2007 United Nations Declaration on the Rights of Indigenous Peoples, which aims to give indigenous peoples self-governance and cultural rights. China voted for the declaration, but quickly proclaimed there were no indigenous peoples in China. China's long-term interests might be better served by embracing international standards. This would require less interference in Tibet, something Beijing has also been reluctant to do in Hong Kong. Agreement with the Dalai Lama may also secure Tibetan and international support. The article of the China Brief of the Jamestown Foundation posted below speaks of a possible policy shift in Xinjiang. The author's conclusions are based on two visits to Xinjiang by Yu Zhengsheng, the new Chairman of the Xinjiang Work Coordination Small Group. Interestingly, Yu, No 4 in the Party and Chairman of the Chinese People's Political Consultative Conference (CPPCC) is also Chairman of Central Tibet Work Coordination Working Group (Small Group on Tibet). Could the China Brief's conclusions for Xinjiang also apply to Tibet? For the China Brief, the appointment of Yu as head of the Xinjiang Small Group "indicates a willingness to explore alternative solutions to the problem in Xinjiang. The fact that both of the party’s new initiatives in Xinjiang—the mass line and accelerated economic development— are drawn from existing Party orthodoxy raises doubts over how the far the center ultimately is willing to go. ...The extent of the shift from a top-down focus on security to one rooted in the mass line will be become clearer as Yu’s tenure progresses." Beginning of July, Yu Zhengsheng visited Amdo region (Qinghai Province) and called "for lasting prosperity and stability in China's Tibetan regions by improving local livelihoods and fighting the 14th Dalai Lama clique." That is not really new. He said that: "The Dalai Lama has long been engaged in secessionist activity that runs against both the common interests of people of various ethnic groups and the traditions of Tibetan Buddhism", adding that the Dalai Lama's 'Middle Way', directly conflicts with China's Constitution and the country's system of regional ethnic autonomy." Though the official Chinese position is often repeated, nobody in Beijing has ever explained why it conflicts with the Chinese Constitution or even answered points by points the Memorandum sent by the Dalai Lama to the leadership in Beijing in 2008. While in Eastern Tibet, Yu said that the policies of the Central Committee toward the Dalai Lama are 'consistent and clear'. He asserted; "Only when the Dalai Lama publicly announces that Tibet is an inalienable part of China, gives up the idea of 'Tibet independence' and stops his secessionist activity can his relations with the CPC Central Committee be improved." For the past 25 years, the Dalai Lama has often repeated that he does not seek 'Independence' any more, but Beijing remains deaf to his message. On the positive side, while visiting a local primary school that promotes bilingual education (Chinese and Tibetan), Yu said that this will help Tibetan students to find employment in the future. Perhaps more interesting, Yu visited the famous Labrang Monastery, 'one of the six great temples of the Geluk school of Tibetan Buddhism' according to Xinhua. 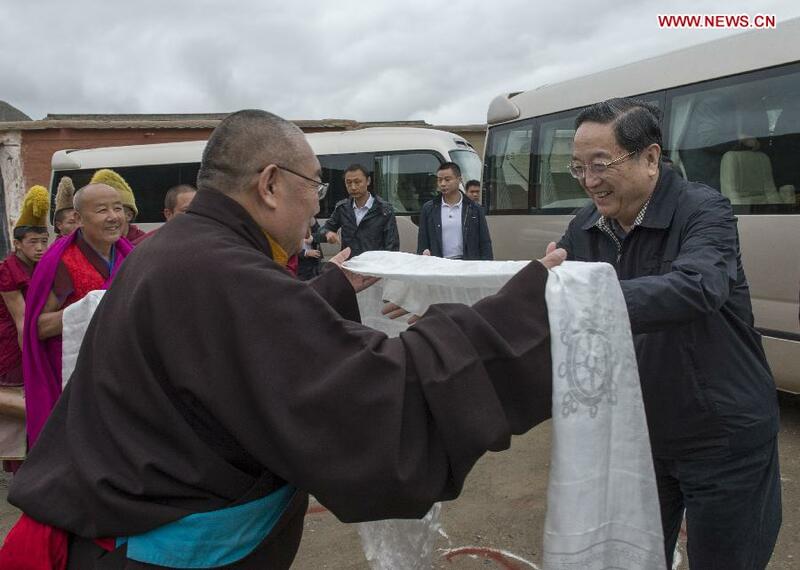 Yu was received by the traditional head of the monastery, the Jamyang Shepa. Lobsang Jigme Thubten Chökyi Nyima, the present incarnation (the 6th) is born in 1948 and currently lives in Lanzhou, the capital of Gansu province. During the Cultural Revolution, Jamyang Shepa became a layman but retained a high degree of prestige in the area. The Jamyang Shepas have traditionally been the most prestigious teachers at Labrang Tashikhyil monastery. It is clear that the Chinese are keen to use the traditional hierarchy to put across their message. In conclusion, like for Xinjiang, the visit of Yu Zhengsheng is a mixed bag of old policies and seemingly fresher moves to release the tensions on the Tibetan plateau. One will have to wait the autumn (or the winter) to see if the new leadership is serious to find solutions to the Tibet's (and Xinjiang's) issues. As fresh violence erupted across Xinjiang in June, the outlines of a new ethnic policy—one rooted in Xi Jinping’s “mass line” approach— slowly may be coming into focus (Xinhua, July 3). One aspect of this shift may be the appointment of a new Chairman of the Xinjiang Work Coordination Small Group, Yu Zhengsheng, which was revealed during his tour of the region in late May. A Standing Committee member and Chairman of Chinese People's Political Consultative Conference (CPPCC), Yu’s appointment breaks from a past tradition of handing control over Xinjiang affairs to hardliners within the political-legal affairs (zhengfa) system. This change in direction also may signal that, despite a resurgence of ethnic violence in the region, the party wishes to redouble efforts at fast-paced economic development, and that Yu, as former party secretary of Shanghai, may be the man to do so. Yu’s appointment was hinted at following his meeting with the delegation from Xinjiang during the National People’s Congress session in March and revealed formally during his five-day visit to Xinjiang in late May (Caixin, May 29). According to a Xinjiang Daily report, Yu undertook an expansive tour that included visits to Hotan, Kashgar, Yili and Urumqi, and he was accompanied by Xinjiang Party Secretary Zhang Chunxian and CPPCC chief of staff and new vice chair of the leading group Wang Wei (Xinjiang Daily, May 29). In an unusual move, Yu also visited Bachu County, which had witnessed a brief bout of sectarian bloodletting the month before. It was here that Yu pledged a “resolute strike” against terrorism, while paying condolences to the government “martyrs” and “heroes” that died in the incident (Xinhua, May 28). Despite Yu’s boilerplate rhetoric on stability, evidence suggests an ongoing yet discreet debate within the Party on how violence in Xinjiang should be handled. Following the Urumqi riots in 2009, the removal of the hardline local Party Secretary, Wang Lequan after inordinately long fifteen-year tenure marked the first step in a different direction. While Wang continues to attend policy meetings on Xinjiang through his new role as vice chair of the Central Political-Legal Committee (CPLC), his replacement, Zhang Chunxian, has emphasized “liberated thinking” and development-based solutions to Xinjiang’s ethnic tensions (Xinhua, May 28; Xinjiang Daily, March 4). Zhang’s policy of “flexible iron-fisted rule” has become the party’s new mantra for the region. The multi-billion dollar state-led development drive unleashed at the 2010 Xinjiang Work Forum also marked a watershed in Beijing’s policy toward its troubled western frontier . The retirement of Zhou Yongkang, China’s politics and law chief from 2007 to 2012, and the subsequent downgrading of his portfolio from the Standing Committee to the Politburo level may yield further policy implications for Xinjiang. While acting as China’s security chief, Zhou wore a separate hat as head of the Work Coordination Small Group and also was the region’s delegate to the 2012 National People’s Congress (Tianshan Net [Urumqi], May 19). In this regard, Zhou followed his predecessor, CPLC chief Luo Gan, who also headed the Work Coordination Small Group, and marked the first link in a line of security officials spearheading policy in China’s far west. Rumors now abound in the overseas Chinese press that the removal of the CPLC from power in Xinjiang marks another step in the targeted relegation of that organization after the 18th Party Congress (People’s Daily, February 5). Indeed, the year preceding the leadership transition witnessed a broad public debate on social management and the party’s stability maintenance apparatus. The CPLC in particular came under fire in party publications for overstepping its authority, interfering in the work of other government bodies and exacerbating social tensions through its heavy-handed reaction to social unrest (“Central Party School’s Critiques Suggest New Leadership Dynamics,” China Brief, June 22, 2012). While the downgrading of the political-legal portfolio after the 18th Party Congress is unlikely to have been driven by minority-related concerns, Xinjiang may now be subject to a broader move within the party away from top-down, coercive methods of stability maintenance. This has been reflected in a recent wave of rticles in the People’s Daily and party journals calling for a shift away from a government-centered approach to social management toward an embrace of the “mass line” (Wen Wei Pao [Shanghai], July 4; People’s Daily, May 19; Study Times, December 10, 2012). “Following the mass line” (zou qunzhong luxian) was first revived toward the end of the Hu administration (“Resolving Contradictions in Social Management,” China Brief, September 21, 2012). Under the banner of fighting “formalism, bureaucratism, hedonism and extravagance,” Xi Jinping also has called repeatedly for reinvigorating the party’s grass roots work, warning that “winning or losing public support is an issue that concerns the CPC's survival or extinction.” China’s internal security organs have since fallen in step, and are now embarking on an education drive amongst grass roots officials about what the mass line entails. On 2 July, China’s Minister of Public Security, Guo Shengkun, called for “all work units to fully understand the significance of the party’s mass line”, and to ensure that “the masses can see, believe and are satisfied with its results” (Legal Daily, July 3). As violence erupted again in Xinjiang in late June, Yu Zhengsheng himself announced in a visit to the region that, in fighting violence and terrorism, the party should “greatly strengthen grass roots work” and “extensively mobilize and closely rely on broad based party members, cadres and the masses.” In a widely reported remark, Yu also singled out “religious figures and the masses of believers to make a greater contribution to building stability in Xinjiang” (sina.com.cn, June 29). The mass line may also explain a raft of what Xinjiang news outlet Tianshan.net terms “new stability measures” by the local public security bureau (PSB). In the first two days of July, Xinjiang’s PSB announced three notices calling the public to come forward with information on terrorist threats and urging individuals to hand in knives and explosive weapons. An official responsible for the new initiative described its “core objective” as to “mobilize the masses, rely on the masses and garner the support of the masses” (Boxun, July 4). Xinhua later reported that the PSB is offering 50,000–100,000 yuan (roughly $8,000–16,000) for valuable information (Xinhua, July 3). On July 1, Beijing also dispatched 50 senior officials to “hostile communities” (di sheqing) in Xinjiang to lead local officials in a grassroots campaign to “widely propagate the party’s ethnic and religious policies,” “ensure that the masses of every minority deeply feels the party center’s concern” and that these ideas are “propagated down to every village committee and every household” (sina.com.cn, July 2). The possibility that the mass line may bring improvement to the Xinjiang problem should be treated with caution. It should be noted, for example, that a string of incidents this year­—including the April violence in Selibuya and fatal stabbings of Han Chinese policemen in Atush city in early July—reportedly have been driven by house-to-house inspections by “community workers” and local police (Radio Free Asia, July 5; Phoenix News, April 25). Grass roots work aimed at achieving stability is also not a new innovation. The “People’s War” launched during the Beijing Olympics by former CPLC chief, Zhou Yongkang, sought to create an extensive network of informants and closed circuit television surveillance systems in cities nationwide (“Beijing Intensifies ‘People’s War’ Against ‘Splittism’ as Nationalism Rears its Head,” China Brief, April 28, 2008). The mass line, however, is indicative of willingness by Beijing to explore solutions that are—in the Maoist sense—socially transformative as opposed to suppressive in nature. Official statements describe the mass line as a symbiosis between the party and the people in which local cadres ostensibly are better attuned to public needs and expectations. In this respect, the decision to consolidate China’s ethnic portfolio under the CPPCC—and its subordinate body, the United Front Work Department—may be an effort to build an ethnic policy that is more responsive to grassroots opinion and also more capable of influencing that opinion. The need for a new approach may even have been formally reached before the advent of the Xi administration. In Hu Jintao’s Work Report at the 18th Party Congress, China’s former leader singled out the united front as “a powerful instrument…for harmonizing relations between political parties, ethnic groups, religions, social groups and compatriots and home and overseas” (Xinhua, November 17). In an August 2012 article in the Study Times, CPPCC member and new Deputy Party Secretary of Xinjiang Han Yong also argued “mass line work under new conditions is the fundamental guarantee of social stability and of realizing long-term peaceful governance” in Xinjiang, later adding that “the masses are the main force in the struggle against splittism and building stability” (Study Times, August 20). As Chairman of the CPPCC, Yu’s appointment may prove to be a modest step away from the previous government hard-line approach to Xinjiang. His past as a prodigious economic performer provides a further reason for his appointment. 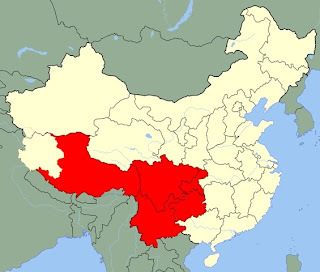 Since the Xinjiang Work Forum in 2010, the government has embarked on an ambitious development program that has seen a marked increase in foreign investment; a pledge for $10 billion to be allocated to the region on an annual basis; and a twinning policy called “duikou” that pairs Xinjiang localities with more prosperous eastern/coastal counterparts (“Xinjiang’s April 23 Clash the Worst in Province since July 2009,” China Brief, May 23). Having successfully steered Shanghai through the global recession, Yu Zhengsheng is well placed to spearhead Xinjiang’s development. During his tenure as Shanghai party secretary, Yu pushed through a new initiative to turn Shanghai into “dual center” (shuang zhongxin) of international finance and shipping center by 2020 and achieved considerable success in rebalancing Shanghai’s economy away from fixed capital investment to consumer spending and FDI (China Economic Watch, November 19, 2012) . This experience will prove useful in the government’s ongoing attempts to open Xinjiang further to regional trade and investment—an effort currently underway through the transformation of Kashgar and the northern city of Khorgos into Special Economic Zones, which have both been recently highlighted by Party Secretary Zhang Chunxian as a regional priority (Qiushi, May 16). Indeed, Yu presided over Shanghai’s support for Kashgar under the duikou policy. This partnership involved the opening of direct flights between the two cities and a multi-billion dollar boost in investment by over 50 Shanghai-based companies, including the creation of a major new Shanghai-Volkswagen plant in Urumqi (China Daily, April 26, 2012; Tian Shan Net, February 14, 2011). While in Shanghai, Yu also proved himself an able public relations operator with the Chinese press lauding his deft handling of a high-rise fire in 2010. In the face of widespread public protest over the Maglev project, he showed an ostensible ability to compromise, promising to postpone the project until further discussions (South China Morning Post, October 1, 2012). Given that Xinjiang continues to suffer low levels of investment—largely due to fears over security—Yu’s appointment makes sense. Indeed, during his May visit to Xinjiang, Yu opened a new series of talks with local officials on how to building stability for industry and commerce (gongshang wending daji). This was followed by Yu’s publicized assurances that tourism, which is a major source of regional revenue, was safe for the public (Duowei, May 28). The appointment of Yu Zhengsheng as head of China’s Xinjiang Leading Small Group indicates a willingness to explore alternative solutions to the problem in Xinjiang. The fact that both of the party’s new initiatives in Xinjiang—the mass line and accelerated economic development— are drawn from existing Party orthodoxy raises doubts over how the far the center ultimately is willing to go. One Uyghur dissident recently dismissed Yu’s appointment in Xinjiang as “old wine in a new bottle” (huan tang bu huan yao) (Voice of America, May 31). The extent of the shift from a top-down focus on security to one rooted in the mass line will be become clearer as Yu’s tenure progresses. During a visit to Srinagar, Garhwal, in March this year, I was told that a total of 95 hydropower projects were being built or planned on different rivers converging in the Alaknanda and Bhagirathi basin of Uttarakhand. Why so many dams, I asked? If the Centre does not go for dams and generate power, then Rs. 10,000-15,000 crore would have to be annually released by Delhi as Central assistance, I was told. The Center wants power and the State, hard cash; dams bring a win-win situation, they say. Projects currently underway were supposed to increase the hydropower capacity of the State to 12,235 MW. Nobody really cared if environmentalists like former IIT professor, Dr. G.D. Agrawal or before him Sunderlal Bahuguna were opposing the wild contagion of concrete infrastructures; they were just labeled as being anti-development by the authorities; ‘development’ being the new God worshiped in the Himalayas. But the gods are neither crazy nor helpless. They showed it on June 16 and the following days, when torrential rains poured from the sky; the result: several thousands of humans left dead or missing, hundreds of roads cut, villages erased, hydropower plants destroyed, a State totally ruined. It was predictable and had even been predicted. One visible consequence was seen in Vishnuprayag where the deluge coming down from the upper reaches of Alaknanda completely buried the 400 MWs hydropower plant. Tragically, the same situation is bound to happen, probably on a larger scale, in Sikkim and Arunachal Pradesh. 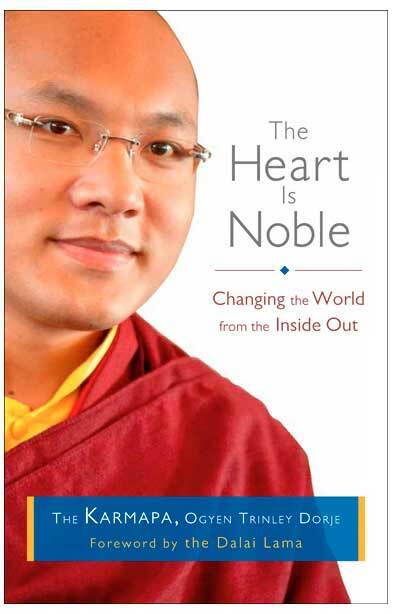 I was in this frame of mind when I came across a refreshing book written the 17th Karmapa, Ogyen Trinley Dorje, entitled The Heart Is Noble: Changing the World from the Inside Out. It is obvious that the Karmapa has studied our modern world ‘inside out’. The background of the book is a month-long dialogue between the Lama (called by everyone ‘His Holiness’) and a group of American university students who visited him in May 2011 at the Gyuto Ramoche Monastery in Sidhbari near Dharamsala. It is there that the 29-year old Lama has found a ‘temporary’ refuge, surrounded by the majestic Dhauladhar range as a backdrop. Though the Karmapa often tells the students (his ‘friends’) that he does not give them a ‘religious’ teaching, the Buddhist themes of ‘temporariness’, ‘interdependence’ or ‘compassion’ pervade the book. The 12 chapters deal with subjects like ‘Our Shared Ground’; ‘A Meaningful Life: Anything Is Possible’, ‘Healthy Relationships: Orienting Ourselves toward Others’; ‘Gender Identities: It’s All in the Mind’ or ‘Consumerism or Greed: Contentment Is the Best Wealth’. One chapter elaborates on Karmapa’s favorite topic, “Environmental Protection: Cultivating New Feelings for the Earth”. The young Lama often describes himself as an environmental activist. Born to a nomad family in Kham province of Eastern Tibet, he says that during his youth he experienced a rustic lifestyle which is unfortunately fast disappearing. The Karmapa asks his visitors to try to realize their intimate dependence with the whole planet. He also sees a close affinity between the concept of ecology and the Buddhist views of interdependence. According to him, it is here that our noble heart should intervene. Page after page, one finds a mature and deep thinker; it is rather rare these days. There is a great lightness in his thought-process, which he is able to share with his young interlocutors. Karmapa would certain support the Bhutanese ‘Gross National Happiness’ which seems to now have been rejected by the new government in Thimbu. Let us hope that the Land of the Dragon will not take the Uttarakhand’s path. It would be such a pity! For him, the starting point is ‘interdependence with others and the planet’; he believes that if each human being can increase his or her own love and compassion towards others, the planet will face much less conflicts. In conclusion, he outlines what he called ‘a kind of humanist spirituality’. There is no doubt that the most serious issue that Asia will have to face during the coming decades is the climatic change and the health of the Tibetan glaciers and rivers which feed nearly 2 billion human beings. Asia definitely needs more young, dedicated, intelligent, modern and open-minded leaders like Karmapa, if it wants to avoid a doomed future. General Fan Changlong is the most powerful general in China today. He is far senior to the Defense Minister, General Chang Wanquan. Whenever foreign dignitaries visit China, they call on General Fan. The latest example is the Thai Prime Minister, Ms. Yingluck Shinawatra. She met with Fan Changlong, vice chairman of the Central Military Commission. It was reported that China and Thailand agreed "to further strengthen military relations". Yingluck Shinawatra asserted that the armed forces of the two countries have made substantial achievements in their cooperation in various fields through frequent high-level visits and continuous friendly exchanges. She also expressed her appreciation over the active roles China has been playing in international and regional issues. That is the usual thing. But when AK Antony, the Indian Defence Minister visited Beijing, General Fan had gone out of town. He was visiting the Indian front (Xinjiang Military District); the pretext was the restiveness of Xinjiang. He wanted to discuss the measures to reestablish ‘stability’ in the region, but also to get the latest news about the Indian border (or LAC). Xinhua reported that General Fan was accompanied by General Sun Jianguo, deputy chief of general staff of the PLA, General Du Jincai, deputy director of the General Political Department (GPD) of the PLA and a member of the all-powerful Central Commission for Discipline Inspection, General Liu Zheng, deputy director of the General Logistics Department (GLD) of the PLA, General Liu Yuejun, commander of the Lanzhou Military Region and Wang Jianping, commander of the Peoples' Armed Police accompanied General Fan. Once again, let us not forget that the Ladakh front (DBO, Demchok, Chumar, etc.) falls under the Xinjiang Military District. Why having fixed a date for Antony’s trip when his main interlocutor was on ‘inspection tour’? Only the babus of South Block can answer this question. Did they forget to do their homework or did General Fan deliberately skip the visit of the Indian Defence Minister? He had probably nothing to offer or benefit from Antony’s visit. The consolation prize for Antony was a short darshan of Premier Li Keqiang, but Li has nothing to do with defence. Speaking about important visits, very few in India have noted the trip to Beijing of Gaurav Shumsher J.B. Rana, the chief of staff of the Nepalese Armed Forces,. General Rana met General Xu Qiliang, an Air Force officer who is the second most powerful general in the Chinese defence set-up. Like General Fan, General Xu is vice chairman of the Central Military Commission. Rana said that "Nepal attaches great importance to developing its relations with China, unswervingly adhere to the one-China policy and will never allow any force to take advantage of the Nepalese territory to engage in anti-China activities. The Nepalese military regards the Chinese military as a reliable friend and hopes to further promote bilateral exchanges and cooperation in various fields". It is not factually correct because Premier Zhou Enlai came to India in December 1956, early January and end January 1957. Three official visits in two months, never seen before (or after) in diplomatic annals. Zhou, probably anxious about the possibility of the Dalai Lama striking a deal with the Indian Prime Minister, repeatedly visited Delhi. The Dalai Lama ‘bluntly’ replied that the Chinese were “forcing unwanted reforms, despite explicit reassurances that they would do no such thing”. The Dalai Lama said that the clever Foreign Minister (and Premier) used his charm and promised that the words of Chairman Mao who had announced that “no reform should be introduced in Tibet for at least the next six years” would be implemented. Generously, he even added that it could be postponed for ‘fifty years, if necessary’. The Dalai Lama was not convinced; then Zhou Enlai asked him not to go to Kalimpong where he was scheduled to give Buddhist teachings to the local population. When the Dalai Lama next met Nehru, the Prime Minister made it clear that that he had to return to Tibet and work with the Chinese on the basis of the 17-Point Agreement. “There is no alternative,” said Nehru, “India could be of no assistance to Tibet”. He even added that he should obey Zhou and return to Tibet without stopping in Kalimpong. However, after the Dalai Lama had explained the purpose of the stop, he suddenly changed his mind and said: “India is a free country after all. You would not be breaking any of her laws.” And eventually Nehru made all the arrangements for the Dalai Lama’s visit to Kalimpong. After the Dalai Lama’s return to Lhasa nothing changed in Tibet. On the contrary the pressure increased, especially after the revolt of the Khampas in Eastern Tibet. The morale of the story is that, it is only when the Chinese can benefit from theses repeated visits, that they agree to it, and if Indians leaders insist to visit China, they are neglected. As for Dr Manmohan Singh’s visit to Beijing, it will probably be as fruitful as AK Antony’; in other words, a nice outing. My article Chinese intrusions will not stop appeared yesterday in niticentral.com. They have done it again. According to media reports, Chinese troops walked into what India considers its side of the LAC; in one of the five reported incursions, they would have come as close as 2 km to the Indian posts. The novelty is that on July 16-17, the Chinese troops used horses and ponies to cross the LAC. All this happened soon after the senior-most general of the People’s Liberation Army, General Fan Changlong, Vice-Chairman of the Central Military Commission, visited the Xinjiang Military District (XMD) on which the Ladakh front depends. Fan was accompanied by several top generals; amongst them, General Liu Yuejun, commander of the Lanzhou Military Region and General Wang Jianping, commander of the Peoples' Armed Police and General Sun Jianguo, Secretary General of the State Defense Mobilization Committee. The visit of this battery of generals is probably connected to the intrusions. The high-level visit to the XMD occurred during the Indian Defence Minister’s trip to China. Did General Fan deliberately choose not to be in Beijing on this important occasion? Was his mission to Xinjiang and XMD more important? To understand the present situation in Ladakh, it is necessary to take a flashback in history. The Year 1959 has been crucial for Sino-Indian relations, first and foremost because of the uprising in Tibet (March 10) and the subsequent flight of the Dalai Lama to India. Undoubtedly the refugee status offered by Nehru to the Tibetan leader and his followers angered the Communist regime in Beijing. After pretending to have ‘liberated’ Tibet since 8 years, for Mao and his colleagues it was the worst slap in the face. But why is the situation still not solved 55 years later? The transcript of a press conference held by Nehru, the Indian Prime Minister in Delhi on September 11, 1959 really opened my eyes. It was a day before he announced in the Parliament that the Chinese had occupied the Aksai Chin. Meeting the media, Nehru talks about the McMahon Line. He mentions notes attached explaining ‘specific points’ (“this place is on this side of the line or that side of the line”), adding that some minor changes were then [in 1914] ‘suggested for practical reasons’: “a Buddhist temple, which was slightly on this side, India's side; but it was greatly valued by Tibetans; so it was put on the Tibetan side”. This is rather vague, as nothing in the published correspondence with Tibet or China confirms this point. More strange is when a journalist requests the Prime Minster to clarify a statement made the previous day in the Lok Sabha (in which Nehru said that Zhou Enlai, the Chinese Premier, thrice accepted the McMahon line in the course of a meeting with Nehru in 1956). “Were things written down?”, asks the journalist. The Prime Minister’s answer is ‘no’, though he says that several years later he had reminded Zhou Enlai of his assurance in a letter. With no official bilateral records, it was easy for the Chinese Premier to repudiate what he had said. What pervades the press conference as well as the debates in the Parliament is prevarication and vagueness! Regarding Longju in NEFA, where a few weeks earlier the Chinese troops had encircled an Indian detachment, the Prime Minister explains that the border “was not strictly delimited or marked. And, as you know, it is mostly in areas where no human beings dwell; may be some do very occasionally, in a very small village somewhere; but broadly speaking, no people live there”. Three years later, in one day (November 19, 1962), Nehru sent two letters begging President Kennedy for military help. He adds: “I do not think that we have kept secret any marked incursion across the border”. But one day later, Nehru would disclose the big one, the Aksai Chin. We shall come to it. The Chinese have fully used this statement over the years to move the LAC to where it is today. To make the matter worse, China is not ready to give a map of its ‘perception’ of the LAC, keeping the issue open for further discussion (and advancement of the LAC). It won’t be easy for the officials from China and India to find a solution to the border dispute and it is doubtful if the Chinese will stop their ‘incursions’ soon. This PTI article seems to mix up the Chengdu Military Region (CMR) and the Lanzhou Military Region (LMR). 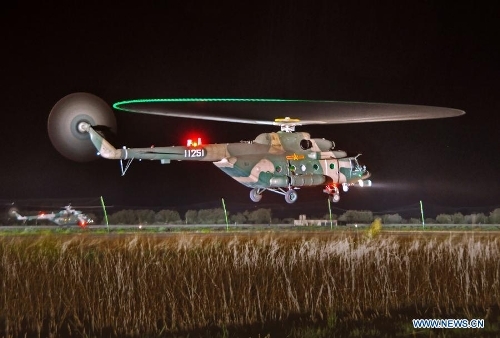 Xinhua reported about "PLA Air Force holds night flight training in Lhasa", which comes under Tibet Military District of Chengdu Military Region. The recent border incidents and intrusions (in Ladakh) occurred in the Xinjiang Military District of Lanzhou Military Region. 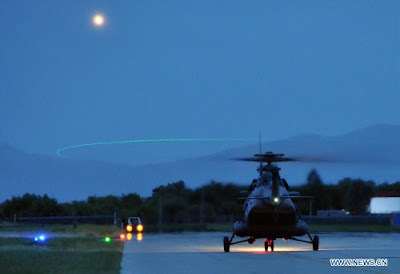 Regarding the choppers' night flight, Xinhua commented on the picture: "A helicopter of China's PLA Air Force takes part in a night flight training at an airport in Lhasa, capital of southwest China's Tibet Autonomous Region, July 22, 2013. This is the first time for the PLA Air Force to hold such training." I earlier mentioned that the Tibet Military District has a new Commander, Major General Xu Yong. In 2007, General Xu was awarded the rank of major general and a year later, he was given the command of the Thirteenth Group Army. Interestingly his predecessor in Tibet, Lt. General Yang Jinshan, who has been promoted as a Deputy Commander of the Chengdu Military Region; he is a member of the powerful CCP's Central Committee. It is not the case of General Xu. Lt. General Yang Jinshan has an Air Force background; this may explain the repeated 'exercises' in the Tibet District, facing Arunachal Pradesh and Sikkim (see map below). 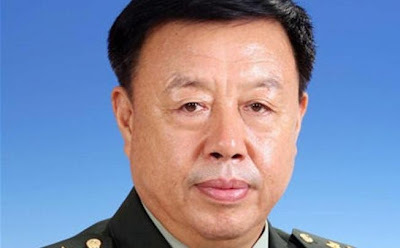 Lt General Li Zuocheng, former Deputy Commander of Chengdu MR recently replaced Lt. Gen. Li Shiming who was commanding the MR since September 2007. The Tibet Military District has also a new Political Commissar, Maj. Gen. Diao Guoxin. In December 2010, he became Political Commissar of the Thirteenth Group Army. He has therefore worked closely with his colleague, General Xu Yong who also served in this Group Army (equivalent of a Corps). Once again, these postings (and exercises) have nothing to do with Ladakh, though amusingly,the Commander of the Xinjiang Military District is also named 'Yong'. General Peng Yong is born in Lulong County, Hebei Province. He joined the Communist Party in 1971, and graduated from Shijiazhuang Army Academy Long-Distance Education Program with a Bachelor Degree in 1998. From 2004 to 2011, he was Commander of 47th Group Army of PLA, under the Lanzhou MR. Since 2011, he is Commander-in-Chief, Xinjiang Military District. Unlike, his colleague in Tibet, he is Member of the 18th Central Committee. He is directly responsible of the operations in Ladakh. By the way, 'Yong' means 'brave, courageous, fierce' in Chinese. Let us hope that both face many 'Singhs' on the other other side of the LAC. BEIJING: China's Air Force has conducted high-altitude night flying exercises at Lhasa, the capital of the Tibet region that borders India. Photographs of helicopters participating in the exercises at Lhasa airport, located about 500 km from the Indian border, were issued today by state-run Xinhua news agency. The Chinese military regularly holds exercises for its troops in the Himalayan region to get them acclimatised to mountain warfare. Last year, the People's Liberation Army held its "first ground to air military exercise" in the Tibetan plateau. The wargame involved scores of fighter jets, hundreds of battle tanks and a large number of ground troops. Amid reports of frequent incursions by Chinese troops along the Line of Actual Control (LAC), Chinese state media said it was "unwise" to let the "isolated incidents" to affect the "promising" China-India ties. While the Chinese foreign and defence ministries were yet to respond to queries relating to the fresh reports of incursions in Ladakh sector, a commentary in the state-run Xinhua news agency accused the Indian media of putting out "sensational reports", "harming" the bilateral relations. "The disputes, a historical hangover, were not created in one day, neither will they be resolved overnight. It is unwise to let isolated incidents along the border to negatively affect the promising China-India relationship," it said. Observers say "isolated incidents" remark referring to the recurring incidents of incursions is the first comment from Beijing on the issue since the first intrusion reported on April 15 at the Daulat Beig Oldi (DBO) in Ladakh sector. So far the Chinese foreign ministry's comments on the incident confined to assertions that the Chinese troops are patrolling their side of the border or played down the incidents saying that the over all situation at the border is peaceful and both the countries signed several agreements to maintain peace and trust building between the two militaries. Significantly the Xinhua commentary was timed to coincide with the talks between officials of the two countries on incursion issue being held in New Delhi today. "Looking back on Indian media hype about Chinese border intrusions, one has to admit such sensational reports are indeed harmful to the China-India relationship," it said. "Such reports have only served to further sow misunderstandings between Indians and Chinese even at a time when their leaders are working hard to manage their differences and to build a constructive relationship that can benefit both sides". It also highlighted the repeated assertions by Beijing and New Delhi that they are committed to maintaining peace and stability along the border before the issues are completely resolved. Indian media traditionally focused heavily on the border disputes between New Delhi and Beijing, are now asserting again that Chinese troops have crossed the "border" between the two countries, it said. 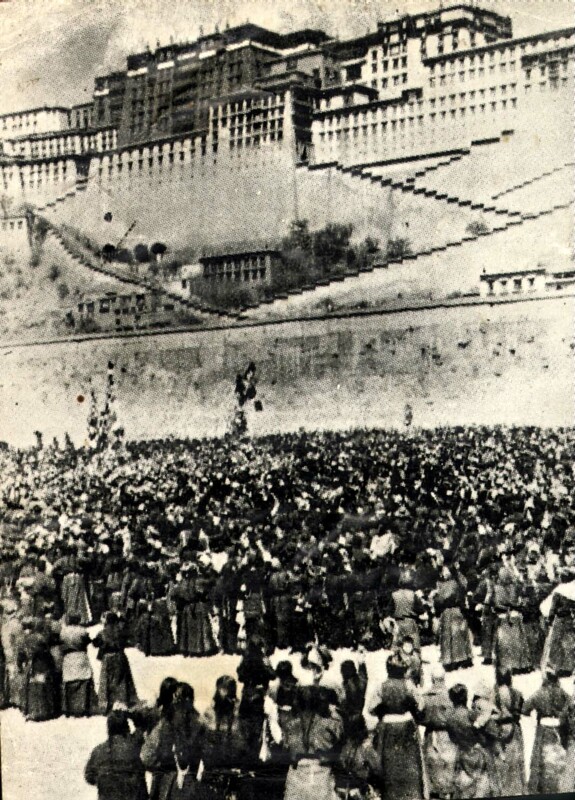 Year 1959 has been crucial for the Sino-Indian relations, first and foremost because the uprising in Tibet (March 10) and the subsequent flight of the Dalai Lama to India. No doubt that the refugee status offered by Nehru to the Tibetan leader and his followers angered the Communist regime in Beijing. For Mao and his colleagues it was the worst slap that they could get in the face; after pretending to have ‘liberated’ Tibet for 8 years, the ‘masses’ revolted against the occupiers and left the Roof of the World to accompany their leader in exile. On my website, I have uploaded a large numbers of documents related with the events of 1959. You can consult them. On this blog, I have recently posted the fascinating transcript of the first encounter between the Dalai Lama and Nehru in April in Mussorie. Today, you will find another interesting document which is the transcript of a press conference held by the Indian Prime Minister in Delhi on September 11. As an introduction, the Prime Minister speaks about radio ‘jamming’ along the border with China. Of course, the Chinese are doing much better today and ‘jamming’ is only a tiny part of the present cyberwar. At the beginning of the press conference, Nehru informs the journalists that the Secretary of Ministry of Information and Broadcasting has no authentic information about the jamming. Today, we would surely get a similar answer about cyber attacks. It has to be noted that the Prime Minister gives this long press conference between 2 sessions of the Parliament. He himself mentions: “I spoke yesterday on this and I am likely to speak tomorrow in the Lok Sabha”. If such press conference was held today, the Opposition would rightly scream that the Prime Minister has no business to speak when the House is in session. But Nehru was then above these details. At the outset, Nehru repeats his argument about the McMahon Line: he does know who initialed it, but speaks of notes attached explaining ‘specific points’ (“this place is on this side of the line or that side of the line”). This is not really the case, except for 3 requests made by Lochen Shatra, the Tibetan plenipotentiary, to Sir Henry McMahon, the two emissaries just signed the map. There is just a short covering letter; in any case, the Chinese were not part of the deal. About the Line, Nehru speaks of minor changes which were then ‘suggested for practical reasons’. It has never appeared in the correspondence with Beijing, though Nehru speaks of “a Buddhist temple, which was slightly on this side, India's side; but it was greatly valued by Tibetans; so it was put on the Tibetan side”. It was one of the 3 points made by Lochen Shatra. No other agreement exists and once again China was not in the picture (as they had not invaded as yet). A journalist then requests the Prime Minster to clarify a statement made the previous day in the Lok Sabha (in which Nehru said that Zhou Enlai, the Chinese Premier, thrice accepted the McMahon line in the course of a meeting with Nehru in 1956). “Were things written down?”, asks the journalist. With no official bilateral records, it was easy for the Chinese Premier to later repudiate what he had said. Well, busy or not, this was an important issue and it was wrong to have not tackled it at that time. Regarding Longju, which had been attacked by Chinese troops a few weeks earlier, the Prime Minister explains that the border “was not strictly delimited or marked. And, as you know, it is mostly in areas where no human beings dwell; may be some do very occasionally, in a very small village somewhere; but broadly speaking, no people live there”. The Longju incident is dealt in details in the White Paper I, which can be downloaded from my website. When one journalist asks: “listening to your speech yesterday, one got the impression that you were trying to make a fundamental difference between Soviet communism and Chinese communism”, Nehru denies having mentioned this topic during his intervention. When someone asks the Prime Minister about ‘changes’ in China, Nehru misunderstands the question, though interestingly, he admits that the changes in Tibet have triggered a change in China’s attitude towards China: “it has angered and irritated them”. The uprising in Tibet clearly marks the end of the Hindi-Chini Bhai-Bhai; during the following months and years, the relation between Delhi and Beijing would harden more and more, till the fatal day of October 1962. Well, three years later, in one day (November 19, 1962), Nehru sent 2 letters begging Kennedy for military help; that was weakness of character. Prime Minister adds: “I can't obviously say with certainty that there has been no straying of some personnel across the border. I believe there has been once or twice, but not exactly military personnel; because, in some areas, there is no demarcation… That might happen anywhere. But I do not think that we have kept secret any marked incursion across the border”. A day later, Nehru would disclose the big one, the Aksai Chin. The fact is that 3 years later, the Indians jawans had not much better than bows and arrows. It was part of the bitter power struggle between the two fraternal Communist countries. It was a way for Khrushchev to put Mao down. He then advises the journalists to consult the Chinese maps claiming part of the Indian territory; Nehru had made them available to the Members of Parliament and he proposes to provide a copy to the press. A few months later, the Dalai Lama nevertheless took the issue to the UN where he obtained a relatively successful resolution. In another words, India can’t do anything for Tibet. The Prime Minister would remain calm and dispassionate during the three next years, but in 1964, he would eventually die of the blow inflicted by China in October 1962. Prime Minister: There might have been, I have no precise information. I am told by Mr. Ramadhyani (Secretary, Ministry of Information and Broadcasting) that he has no authentic information about it. In fact, he is inclined to think there is no jamming. There might be sometimes, nobody can say. There is no regular jamming. Prime Minister: We will go on to the India-China issue. There is not really very much for me to say, unless you want to ask me a question, because I spoke yesterday on this and I am likely to speak tomorrow in the Lok Sabha. Question: Could you tell us where the definitive map of the McMahon line is and who initialed it? Prime Minister: We have got maps in our Ministries; I don't know where else they are - may be elsewhere too. I cannot at the moment say who initialled it; but we have got notes attached to it, explanation notes by McMahon and others who worked with him, and there specific points are mentioned - this place is on this side of the line or that side of the line. You see, the broad approach was, I think, to get at the water-shed - make that the dividing line - waters flowing towards India, waters flowing towards China. In one or two places, the names I forgot, some minor changes were suggested for practical reasons. For instance, there was a Buddhist temple, which was slightly on this side, India's side; but it was greatly valued by Tibetans; so it was put on the Tibetan side. I think it was not McMahon, it was subsequently agreed. Question: Yesterday in your speech in Rajya Sabha you said that Chou had repeated thrice his acceptance of the McMahon line in the course of his conversations with you in 1956 and that you did not entirely rely on your memory, but had those things written down. Did you exchange those written notes with Chou? Prime Minister: At that time? Prime Minister: No. Subsequently, long afterwards, I did send him an extract from it; it appears in the White Paper. I did not at that time send it to him. Question: When was that extract sent to him? Prime Minister: It is given in the White Paper - in one of my letters. Question: Were the minutes of the talks confirmed by Chou En-lai? Prime Minister: No; I am telling you I did not send him the minute. The minute I wrote was for record in our own Ministry and for our Ambassador etc., in Peking to be informed about it; but it was not sent to Mr. Chou En-lai. Question: Even now, I don't think Mr. Chou En-lai has specifically repudiated that talk. Prime Minister: No; that is true. Prime Minister: I had not seen it recently; but I have a vague recollection and in examining Chou's letter we tried to find these things out. But I have a vague recollection that a telegram did come to us at the time we were becoming independent. As far as I remember, at any rate the impression created in my mind was not about any major change there; but about some petty areas in dispute on the border. There had been disputes before; but I would not like to answer it because I have not referred to it again and this is the old impression when we were busy with Independence and all the change-over. Question: Yesterday you made an offer of neutralisation to China over Longju. What will be the position if the Chinese refuse to quit Longju? What will India do, if they refuse to evacuate? Prime Minister: As a matter of fact, I believe, the Chinese say that they are not actually in possession of Longju - may be round about it. The distances are very small. According to us, Longju is just on this side of the border. It is marked so in the map we have and it is the factual position. A little way round about there, presumably are Chinese forces; a little to the south of that, possibly, small Indian detachments - on our side, pretty small. We will have to see what developments take place, but obviously we want to avoid a show of force to push this or that, because one thing acts and reacts. This has been the first time, at Longju, that this firing took place between the Chinese and Indian detachments. Question: Could you kindly throw some light as to what precisely was the Sino-Tibetan border before the 1914 treaty? Did the McMahon line, by and large, confirm a traditional border? Prime Minister: Well, the idea was that it confirmed some kind of a border; but it was not strictly delimited or marked. And, as you know, it is mostly in areas where no human beings dwell; may be some do very occasionally, in a very small village somewhere; but broadly speaking, no people live there; or, if people use it, they use it in summer for grazing purposes, retiring in winter. So, there was no urgent need for anyone to define it accurately, neither for the Tibetans nor on this side. But I could not answer your question very precisely. Question: Is Longju a city, or a village? What is the population of this place? Prime Minister: I suppose it is a very small village with a few huts. Question: In the light of your statement yesterday in the Rajya Sabha that Premier Chou En-lai's recent letter has shaken confidence in the assurances and words of either side and the presence of large Chinese forces in Tibet, do you envisage any large-scale change in our defence expenditure vis-a-vis our future planning? . Prime Minister: No, I do not and I hope not. Question: Listening to your speech yesterday, one got the impression that you were trying to make a fundamental difference between Soviet communism and Chinese communism. Will that impression be correct? Prime Minister: I thought I did not refer to either. I do not think, as far as I remember, that I used the word 'communism' in the whole course of my speech. Question: But there was some reference to it. Prime Minister: I said nothing about communism. I do not think communism has much to do with it. Question: Yesterday you said something that these things may be happening because of internal happenings in China. But you did not elaborate on it. Can you say what internal changes you had in mind? Prime Minister: Are you referring to that minor event that happened ten years ago, the Chinese Revolution, or what? Question: You were saying yesterday that gradually, step by step, there had been a change in the Chinese attitude. Prime Minister: That was only a remark. Various factors have produced certain results, and one, I actually said, was may be, what has happened in Tibet and our reaction to it. I said that it has angered and irritated them; and there may be other factors. Question: Could you say something about the possible conflict of views in the leadership of China? Prime Minister: How do I know about it? Many of you talk about conflict of views in the leadership of India! Question: In the Lok Sabha, the other day, you said that though you do not expect a war with China, one must be prepared for any eventuality. In case of war, will India seek allies in the large world, is there is a full-scale attack from China? Prime Minister: That is a very interesting question. I should like you, for your own benefit, just to think and answer it for yourself. It is interesting because I just don't see what I can do about it. Just don't think vaguely; think precisely and think a little definitely. It is one thing to have friendship of countries; it is another thing to have military alliances and the like. One does not know, if the whole world is at war, what might happen. That is a different matter. But this vague thinking of searching for allies is a sign of utter weakness of character in an individual and in a nation. I hope, our country will not suffer that weakness of character. Question: As a result of this Khampa revolt in Tibet, there have been many more violations of the NEFA border and pressure on NEFA than you were pleased to disclose. Is it not true? Prime Minister: Is that an indirect refection on my integrity, or what? Question: Probably, you might not have sent diplomatic notes about them because they were of a minor nature. Prime Minister: No; I do not think that is a correct statement. I think that we have in recent weeks disclosed this. I can't obviously say with certainty that there has been no straying of some personnel across the border. I believe there has been once or twice, but not exactly military personnel. Because, in some areas, there is no demarcation. A survey party or somebody comes across and once or twice they came across into the Indian territory and they went back. That might happen anywhere. But I do not think that we have kept secret any marked incursion across the border. Question: In your Rajya Sabha speech, you referred to the letter of Mr. Chou En-lai in some grave terms and indicated that a grave situation has arisen. Would that mean that you would be able to undertake your visit to these countries (Afghanistan and Iran) in the next few days, or stay back? Prime Minister: I am certainly going to Kabul and Teheran in three days' time. What has that got to do with it? That is taking an extraordinary, alarmist view? When I referred to the letter in same serious terms, it was not because I expected some remarkable development quickly or even later, but that the letter showed a certain hardening of attitude. And it is always serious thing when in a controversy any country digs its toes in. Then, it becomes a question of prestige, how to undig or pull out your toes. In that sense, I said, it is a serious matter, but I do not expect at all any sudden development which would lead to any kind of conflict, even a small one. Question: Is it in pursuance of this belief that you are not issuing any weapons of offence to our Indian troops? Prime Minister: What do you think? They go about with bows and arrows? The Press Correspondent: There is a lot of difference between weapons of defence and weapons of offence. Prime Minister: Well, you are an expert at it! Question: What was your assessment, of the Communist Party's attitude towards this controversy - yesterday's speech by the Communist spokesmen? Prime Minister: The Communist Party of India? There is no question of assessment. Anybody can make his assessment. One felt that they were in an embarrassing position. That is the main assessment. May I say one thing - it is really worth your attention - the statement that was issued by the Tass agency yesterday presumably representing the Soviet Government's view. Considering everything, it was a very fair statement, and an unusual statement for the Soviet Government to sponsor. Question: May I invite your attention to your statement in the Lok Sabha about wrong Chinese maps being circulated. Now Mr. Chou says his maps are right. Does it show an attitude of imperialism on the part of China? Prime Minister: This is an argument. Question: Your comment on the Soviet position? Prime Minister: I appreciate it very much. Question: In your speech yesterday you mentioned that something had happened because of the change of policy in China. Were you referring to the Tibet part only or to internal changes inside China itself? Prime Minister: I cannot tell you what I had in my mind at that time. But I should imagine all these things inside also were somewhere at the back of my mind. Question: You referred to the Tass statement which reminds me of your statement in the Lok Sabha yesterday that you would welcome mediation by parties acceptable to both China and India. Since some of those possible mediators have already accepted and published officially the maps as in China Pictorial, would it be possible for this country, to envisage mediation by countries which may be slightly different, say some of the Bandung countries? Prime Minister: When I talked about mediation, conciliation etc., I was thinking about a number of small border disputes. Some of them are old disputes going back to the days when the British Government functioned here - small disputes about two miles, three miles here, a village here, a meadow there. They had no great importance in those days because neither party attached much importance to that area. But these were continuing small disputes. They are those which have become important now because of various developments. Of course, every party now is very much conscious of that border and frontier. Previously they were not, they took it for granted. They have become important. I really was referring to that. When I talked about mediation, I was not thinking of inviting any country, Bandung or other. It is a small matter. Normally what is done is, each country affected appoints a representative to discuss and those representatives choose, may be, a third and they sit down and deal with the matter. You can't make these small matters increase their importance and ask other countries to mediate - ridiculous. We resort to some procedure, whatever it may be. But the bigger question - I had not spoken of the bigger question that is of large areas which are shown in the Chinese maps. That I had not in mind then. Prime Minister: Look here, do you want to create family quarrels? (Laughter). It is always unsafe to make general and sweeping statements, even though the statements may have a grain of truth in it. Question: You have promised Parliament that you will make available in the library maps which show places involved in the border incidents. Would it be possible for a copy to be made available to the Press? Prime Minister: Well, the maps we have placed in the library of Parliament are four or five. One is a Chinese map, a wall map which shows these frontiers according to China. But, really, unless you know Chinese it is little good to you. You won't understand it. Then, we have placed two copies of Chinese periodicals giving that map on a smaller scale. You probably have seen it. Some of you might have seen China Pictorial and others. We have also placed a map of India, one of our maps, indicating where the Chinese map comes in the border and indicating the passes etc. I will find out from my Ministry what can be done to provide you with this assistance to understand this border. Question: Have the Chinese explained anywhere where exactly is the boundary? Prime Minister: No. Not in all the correspondence anywhere. We will go to the next subject. There have been too many questions on one item. Question: About Bhutan and Sikkim, yesterday you avoided any reference to Mr. Chou En-lai's statement in that connection, in his latest letter. Would you comment on that portion? Prime Minister: No, no. I would not comment on that question. There is nothing to comment really. If I say anything I will say it tomorrow. Question: There is a report going about that General Ayub has offered military aid to India in case India is invaded by China. Is there any basis of truth in it? Prime Minister: It has not reached me - the report. Highly unlikely, if you say anything like that. Question: One question on Tibet. You said several times that taking the Tibetan question to the United Nations will not do any good. In view of the strength of feeling of the Dalai Lama, could you say what harm you think it will do? Prime Minister: I have mentioned two reasons, because in my view - and I have been advised by people who know better these things - procedurally and according to the Charter it cannot be brought up there. Of course, you may go beyond the Charter or anything, but Tibet has not been recognised by any country, practically speaking, as an independent nation. Therefore, it has no independent status there. From that point of view, therefore, you cannot deal with it, as if an independent nation comes to you. On the other hand, the other part may be on the basis of human rights. Possibly, the fact that China is not a member, has not accepted the Charter or the Human Rights Declaration, or indeed is not in the United Nations at all, also makes it difficult to do that. But the real answer, I think, to your question is not a legal or procedural one, but what good or harm it might do. Obviously, it cannot lead to any positive results, as far as I can see, except strong speeches. Now, if you think that those strong speeches are going to result in achieving any objective, I do not see it. Tibet immediately becomes, even more than it is, the Tibetan question, a part of the cold war; and everything that becomes a part of the cold war becomes in that context more insoluble than ever till some wonderful, sea change comes over all the world. Instead of bringing relief to Tibet or the people of Tibet it actually may have the opposite effect. Question: What shall be India's attitude if some other country sponsors Tibet's case in the United Nations? Prime Minister: I have told you and I have announced publicly what we think about it. It may depend on what comes up, in what form it comes up. There are so many things. But our views are quite clear about it. Question: You told the Lok Sabha last week that no doubt many things have happened in Tibet which are deplorable. Is there anything that any outsider can do in this respect? Is there anything that can be done from the outside? Prime Minister: I do not know if an outsider - an individual, or a group or a country - can do anything. It is difficult to answer that question. This world is full of deplorable things about which perhaps, as an individual, one might do something, at any rate, I might say, in the shape of protests and dissociation and at that. A country, although, supposed to be much more powerful than the individual, has to function in a more limited sphere, the Government of a country, anything. One thing I should like to say. We began today with discussing the India-China question. I do not think, and I told you, that anything big is going to happen in the foreseeable future, because I cannot imagine any greater folly of either country than to encourage anything or permit it. Nevertheless, the seriousness of the situation is not some border trouble, a mile on this side and a mile on that side, but the growing feeling of estrangement, irritation and sometimes anger, on both sides. That is 'a bad thing and that is a thing we have fought against not in regard to China only but in regard to any country in the world. That is to say, it is a feeling which accompanies the cold war outlook. The moment you get that, whatever the rights and wrongs of a question might be, the moment you get that, you have got into the wrong atmosphere, you lose your moorings, mental, psychological. You are excited, passionate, angry and it is not a good thing for a country or a people to become that. I attach very great importance to it because that is the normal war psychosis or whatever you call it. There may be no war. I would beg of you - I do not ask you to treat this question lightly because it is a serious matter - to help in preventing people from getting excited. It is very easy for people to do that, it is so easy. And because of this I have regretted some type of demonstrations that have taken place here in Delhi and elsewhere before the Chinese Embassy. You know that we have all kinds of demonstrations and troubles internally. I do not like them but they do not very much matter. After all it is an internal matter, but you cannot project this internal behaviour on to the external field. That is dangerous. Something happens on the other side of the same type, then you get angrier still. This kind of thing does not lead to anything. It should not be the behaviour of a mature, thoughtful country. We should be firm but we should be at the same time not function in an angry and excited way. We should avoid these demonstrations which are no signs of strength. They do not affect anybody outside, nobody is frightened by them. Yesterday, I wrote about the “Measures to Determine Qualification and Employment of Religious Instructors in Tibetan Buddhist Monasteries”, published in December 2012 by the Chinese government. One of the reasons why Beijing has promulgated these 'Regulations' is because the Communist regime plans to make of the Tibetan Autonomus Region a mega tourist park. 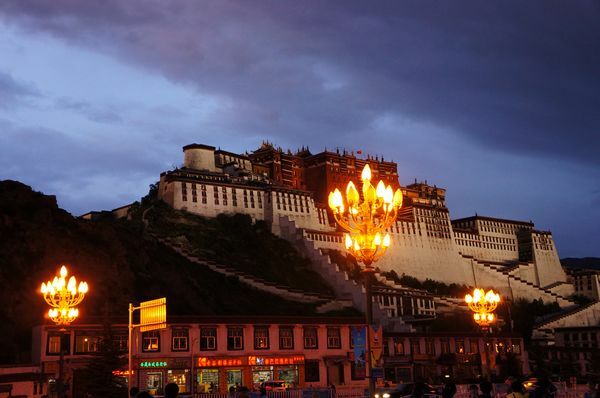 A recent report from Radio Free Asia speaks the ‘Disneyfication’ of Lhasa. Meanwhile, despite similar online campaigns by overseas rights groups against the U.S.$244 million renovation of Lhasa’s Barkhor district, the U.S.$2.44 million renovation project has been completed, China’s state media reported Monday. More than 100,000 people had signed a petition by New York-based Students for a Free Tibet calling for a halt to the renovation, and a blog post by Beijing-based Tibetan writer Woeser titled “Please Save Lhasa” went viral on China’s microblogs before being removed. 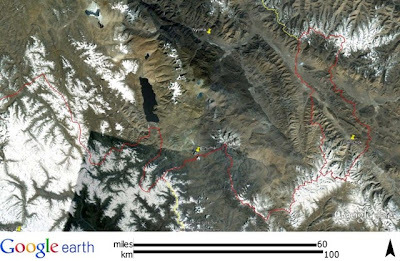 “Lhasa is being destroyed by excessive commercial development,” Woeser said in the May post, which reported that plans for the city also include the development of a 150,000 square meter (1.6 million square feet) shopping mall in the Barkhor, with residents and shopkeepers being relocated. State media have said the Barkhor renovation project is aimed at modernizing outdated infrastructure by upgrading the sewage system, water supply, and electric lines. UNESCO has included the Jokhang Temple—considered the most important temple in Tibet—as well as other parts of Lhasa including the Potala Palace—home of Tibetan exiled spiritual leader the Dalai Lama—on its list of World Heritage Sites. The temple has been a symbolic center of Tibetan protests against Chinese rule in Tibet and the Barkhor was a center of Tibetan unrest in 2008 that left at least a dozen people dead. 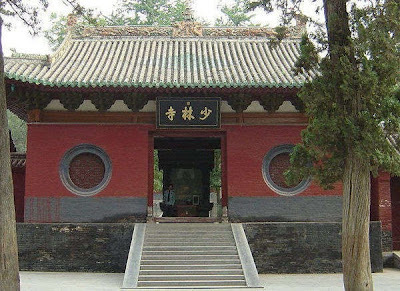 The story of Shaolin Temple is telling. Ticket sales alone brings US $ 24.4 million a year in the coffers (the dispute mentioned below is about which coffer should the god-send hard cash benefit). Party's officials lecture the monks "What's the use of so much money for you monks that should do no more than reciting your sutras?" The monks would obviously like to have the major piece of the cake as they are the ones who are photographed by the tourists. Rumors say that the temple was going to be listed on the stock market. Tibet is witnessing a 'shaolinification' on a much larger scale. 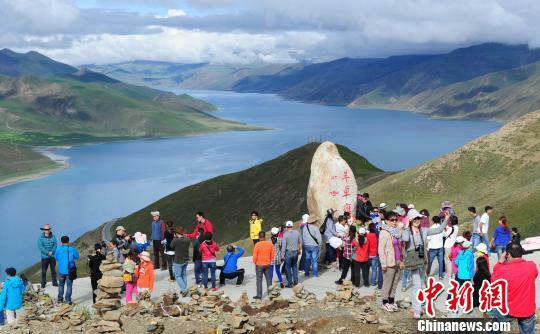 China Tibet Online reported yesterday that the Tibet Autonomous Region witnessed a new tourist boom in the first half of 2013, 'before the approaching peak season'. According to the statistics provide by the Tibet Tourism Bureau, tourist arrivals reached a record high of 3.43 million bringing some US $ 500 millions in revenues. Can you imagine, and this during the lean season? In the first half of 2013, the number of tourists visiting the region increases 21.8 % compared to last year and the revenue showed a 32.1 % growth. Xinhua explains: "In recent years, Tibet tourists increased year by year thanks to improved transportation and tourism infrastructure. To attract more tourists to Tibet and ensure their health and safety, the regional government has launched its first 'altitude sickness insurance' against Tibet’s special geographic environment." More than 15 millions Chinese tourists are expected in Tibet by 2015, and this for a local population of hardly 3 millions. Here again, China is 'far in advance' on India and Uttarakhand in particular. But it would perhaps be wise for the Chinese leadership to study what has recently happened in the Indian Himalayas. Another issue is the attitude of the Chinese tourists who are said to be very rude. South China Morning Post carried an article on how Chinese tourists are misbehaving. It remained for weeks on the top of the most read features. 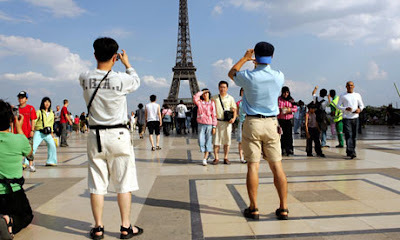 In the meanwhile, France, one of the world's major tourist destinations for Chinese tourists, has issued advisory information on how to deal with Chinese tourists: "A simple smile and a greeting in their language satisfies them completely," the guide issued by the Regional Tourism Council of the Paris Chamber of Commerce says. Just say 'Rouanne ing gouang linne' to the Chinese visitors, they will melt. The notes explains the habits of the one million Chinese visiting Paris every year: "They are avid shoppers of luxury brands. They are picky about food and wine. They appreciate ingenious shopping suggestions". 'Do You Speak Touriste? ', the guide (for 10 different nationalities) in helps particular the poor Parisian hoteliers and taxi drivers to deal with the Chinese tourists. Of course, this problem does not occur in Tibet where the local population has no choice by to speak Chinese. Surveillance cameras have been found in the abbot's room at Shaolin Temple, with one pointed at the abbot's bed. An employee told yesterday's Economic Observer they were discovered during renovation work. It's not known who installed the cameras but the employee believed there could be a link with disputes over the temple's growing popularity as a tourist attraction. The temple in Dengfeng City in central China's Henan Province is renowned as the birthplace of kung fu. Whenever there are disputes between the temple and other parties, rumors fly, the report said. In 2011, it was said that Abbot Shi Yongxin had a mistress who was a student at Peking University and that he had US$3 billion deposited overseas. The mistress and an illegitimate son were said to be living in Germany. A temple spokesman said later the rumor was not worth responding to. It had spread after a city government bid to demolish a temple courtyard to build a hotel was foiled shortly before demolition started. The lion's share of profits evolving from Shaolin Temple go to the local government, the report said. Ticket sales alone amount to about 150 million yuan (US$24.4 million) a year, with the government taking 70 percent. Sometimes the government delayed giving the temple its share, and Shaolin monks protested about that at the government offices. However, the temple was accused of being "too commercialized." Officials were reported to have said: "What's the use of so much money for you monks that should do no more than reciting your sutras?" There was also a rumor that the temple was going to list on the stock market, something Shi has denied many times. Shi is also said to have displeased the city government by taking center stage in group photographs with important visitors. Upset officials are said to have complained that Shi "didn't have the sense of ceremonial rules." When gifts were presented to visiting officials, Shi waited for them to come forward. But some officials believe Shi should come forward to present the gifts in a respectful way, the report said. When Russian President Vladimir Putin visited the temple in March 2006, a provincial government official tried to put his seat at the same level with Shi, who was receiving Putin, but was stopped by one of Putin's bodyguards. There are many people keen to cash in on the fame of the temple, the report said. Some companies registered trademarks including the word "Shaolin," for example, and various competitions such as a "Kung Fu Star" contest and a beauty contest were held near the temple. Kung fu training schools named after the temple were also being established. The report said there had been many disputes since the Dengfeng government got together with China National Travel Service (HK) three years ago to develop the temple into a tourist destination. To attract more investment, the local government gave up its controlling stake in the scenic area of the temple to the travel service at a low price. In return, the travel service was to invest in construction projects while expanding tourism. However, over the past three years it had made huge profits from the temple's tourism industry but hadn't invested in any projects, the report said.